Biological coincidence is no basis for lifelong relationships. My father died when I was 24 years old; my mother followed four years after. My mom’s death, in particular, left me emotionally unanchored. I had not yet started my own family and my messy, complicated relationship with her had been my center. 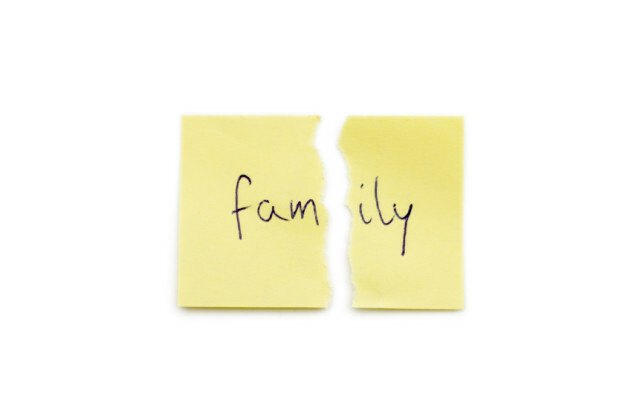 As the youngest of seven children, one might think that I had plenty of family connections to help me through that difficult time, but for m,e the story of a “big happy family” was a myth. Over the course of the next 15 years, my siblings and I separated to the point that I now have no contact with them beyond Christmas cards and Facebook. The separation was not easy, but I have grown to realize that biological coincidence is no basis for lifelong relationships. Mine is not a story starring myself as the good guy and my siblings as villains. It’s a story of damaged people. My sisters and I all have stories to tell of my mother’s abuse. (My brothers have stories too, but they choose not to tell them). Our mother was both physically and emotionally abusive with my older siblings until she became the focus of an investigation by child protective services. The physical violence waned after that, but the hateful rants did not. Racked by untreated anxiety, my mother sought to flatten us into quiet and unquestioningly obedient children. I spent my youth vacillating between shadow living in an attempt to avoid attention and sarcastic mean-spirited outbursts meant to proclaim my existence as an independent being. As the youngest child, with siblings a decade and a half older than me, I had several adult brothers and sisters who knew all too well the kind of environment I was growing up in. Several of them were kind enough to provide me balance. They invited me to spend nights at their house and gave me the sort of positive attention I did not get at home. With them, I was understood and valued. Or, I was at least partially understood. Throughout my childhood and well into my adulthood, I kept a very scary secret. One of my brothers sexually abused me over a period of several years (so I guess my story does have a villain after all). From my perspective as a 6, 7, and 8 years old, I knew that telling either of my parents would make my shadow living impossible. Intuitively, I knew that honesty would backfire on me—my story would exponentially multiply my mother’s anxiety and she would not hesitate to crush me in her efforts to silence me. As a child, I never considered telling my other brothers and sisters. While they lovingly provided me with positive support to counterbalance my home life, they did not and would not interfere with the way my mother treated me. I have always assumed that they were just happy to be out of the house and were not inclined to revisit their own childhoods by intervening in mine. If I’d had a younger sibling, I would have done the same. Our mother was formidable. So my childhood was about managing my mother and taking what my sisters and brothers offered in terms of support. As I moved into adulthood, these relationships all changed. My mother became a very different person once she no longer was responsible for me. Her anxiety lifted and she made the space to get to know me as a total person. As for my siblings, I largely neglected those relationships. I was much more interested in time spent with my friends in bars than in hanging out with my family. I mostly saw my siblings during our simultaneous visits to see our mom and dad. My mother’s death thus left a huge void. It didn’t help that I lived 500 miles away from my family and so in-person visits were only possible a couple of times a year. And selfishness on both sides intervened. I grew very close to one sister in the immediate aftermath of our mother’s death, but dropped her once I was ready to move on. Another sister went to great lengths to stay connected but lost interest in me once I was in a relationship. The only healthy relationship I managed was with my oldest brother and his wife, but sadly he passed away at an all too early age. And for me, always, there was my secret of sexual abuse. As I settled into married life with my partner and we discussed having a child of our own, I became flooded with anxiety and depression that matched my mother’s. My trauma was so severe that I was hospitalized many times over the years. I finally came to the conclusion that I needed to tell my brothers and sisters. By keeping it a secret, I was keeping the abuse in front of me—always there was the question of would I need to tell, would I ever tell? The only way to put it in the past was to complete the process of telling. My brothers and sisters didn’t take it well. One sister hypothesized that I had misunderstood the intent of the contact (as if being held down while your brother penetrates you is open to interpretation). She also provided me with a prayer of forgiveness that I was supposed to repeat until I was able to let go of my anger. A brother promised to confront my abuser but then backed out, never mentioning it again. The reaction undid me. All of the old hurts at being forced to keep secrets came back. My siblings largely closed themselves off to me after my revelation. There would be no further discussion. But emotionally, I did not let that be the end. I played their rejections over in my mind hundreds of times, each time making myself more depressed and anxious. Far from putting the abuse in my rear view mirror, the telling mushroomed my secret into an atomic bomb that threatened to blot out my life with my partner and son. And for what? Those sibling relationships had been on life support for years. I was holding on to the idea that I could somehow repair the past through them. And I got stuck on this idea to the point of threatening my relationships with my wife and son—the basis for everything bright and hopeful in my life. Along with releasing the story of abuse, I realized it was better for all involved if I let those relationships go as well. It makes me sad sometimes. But I see the past more clearly. Their response to my sexual abuse is really less about my siblings’ relationships with me and more about how they have chosen to deal with their own childhoods. I introduced a huge plot twist, and they just don’t want to go back and reconcile this with everything else that happened. I get it even if I don’t like it. There’s no point in anger. I appreciate all of the things they did do for me when I was young. And I hope that they are happy. I intend to be.